Home / Blog / Not Lost, Just off Adventuring! Not Lost, Just off Adventuring! Traveling on the SAI trips with entire groups of other study abroad students and people who actually know their way around the places we are visiting is great. I have been on amazing trips with SAI, however, my favorite experiences have been when I have traveled on my own or with a few of my friends. Planning trips on my own or with my roommates has been an interesting experience. Looking for the best deals while scheduling trips around my classes proves to be a challenge sometimes. 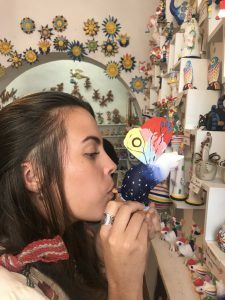 Even though it is easier to show up to preplanned trips with SAI, I wholeheartedly believe traveling on your own is an experience everyone should try as a young adult. I thought I was in a dream when I was in Venice! It was magical! I traveled alone to Munich for Oktoberfest without using a travel company. It was a long, stressful journey, but I had an amazing time and made so many new friends. I took a train to Bologna at midnight, then had to take a cab to the airport. I was unaware that the airport didn’t open until 5 a.m. the next morning so I had to sleep in the front of the airport by the check in line all night. I was scared to sleep there since I was alone so I stayed up all night on the phone with my friend. When I finally got on my plane, I was exhausted and starving. The flight was short and I had to figure out how to get to my campsite from the Munich airport. Unfortunately, I had no service and there wasn’t any wifi. 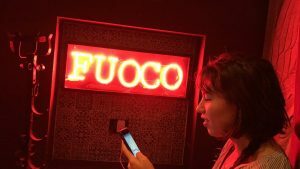 I couldn’t contact my friend who I was meeting or translate German signs. The German people I met were so helpful and translated the train map for me. I took a picture of the map, but didn’t realize the directions provided to me by my campsite were from the center of Munich not the airport. It was a minor setback, but didn’t phase me. I walked to my bus stop with some girls from London staying at the same place. After checking in and attempting to connect to wifi, I came to the realization I would not have service all weekend. A barista at the coffee cart near the campsite, such a sweetheart, let me use the rest of his data so I could call my friend. I soon found out there had been a miscommunication between my friend and I. I arrived in Munich at 8 a.m. and she didn’t get to the campsite until 5 p.m. The campsite was filled with people from all over and many other study abroad students making it easy to meet new people. I made friends with several groups of people and the guys who worked at the campsite. The two Australians staying in the tent next to me live in London, I am traveling there and we have plans to hang out while I’m in town. I also met a group of guys from New Zealand who I spent most of the day with until my friend arrived to the campsite. I was forced to move outside of my comfort zone by using public transportation and meeting new people on my own. By the time I was leaving I was an expert on the public transportation of Munich and even directed some groups of people who were lost on how to get to their destinations. I really believe I grew as a person on this trip while gaining a newfound confidence in myself. 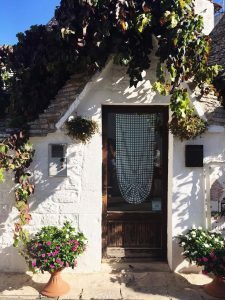 Living in our little Trulli in Alberobello! My roommates and I have traveled around Italy on trips we booked ourselves. There were always setbacks and minor dilemmas, however, we made the best of every situation taking it as part of the adventure. My roommate, Grace, and I recently traveled to Venice. The trip got off to a rocky start because we almost missed our bus. With all of our bags on, we sprinted through the Florence train station to the bus stop. It was a nice little workout before our four hour bus trip. We stayed in a modern, trendy hostel, Generator Hostel. The bar and cafe area had amazing affordable food as well as a nice ambience. The water buses in Venice don’t really run on the actual schedule posted making it difficult to get to certain islands. The island our hostel was on wasn’t a tourist island, so at night it we couldn’t find the right boat and it took us almost 2 hours to get home. One of the captains realized we were having a hard time and helped us find the right boat. We had been up since 4 a.m., and by the time we got to our hostel it was 11:30 p.m. Grace and I were so tired but the experience is one we will never forget and we met so many interesting people along the way. 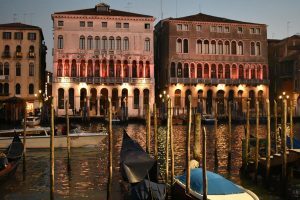 We believe people who say Venice is too expensive aren’t planning their trips right because we had an amazing trip while spending very little money. Learning how to travel cheaply is one of the best things I’ve learned since being abroad, as well as how to utilize public transportation. 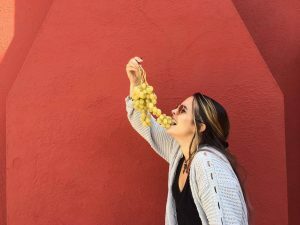 Photoshoots with 2 euro grapes in the colorful town of Burano! Currently, my roomies and I are on a trip to Alberobello, Italy. Rachel, Grace, and I took a nine hour bus ride to Bari where we had to walk around with all of our bags until our train to Alberobello. We had a little bit of trouble finding the right train station, but our train ride only cost 4 euros. Our Airbnb host, Andrea, picked us up from the train station. We are staying in small houses called Trulli, common building of the region. The airbnb, Trulli del Bosco, is in the countryside near Alberobello. It takes 15 minutes riding bikes to get to town. Andrea drove us to nearby towns and gave us private tours of Locorotondo and Martina Franca. We met a cute older woman who demonstrated how to paint pottery, offered to make us coffee, and blew us kisses when we were leaving her tiny shop. Andrea’s Nonna made us a homemade meal for our first night at the Airbnb. It was amazing! We have made friends with all of the animals on the property: geese, chickens, and donkeys. But we have fallen in love with the neighborhood cat, who we named Dante. He comes to our door every morning and night, then proceeds to follow us around. We want to take him home with us. We happened upon a dance party in the middle of the main road of Alberobello and lost track of time. Andrea didn’t even call us to see if we needed a ride, he just drove to town to come pick us up so we wouldn’t have to walk back in the dark. This trip has been so relaxing and the first time I feel I have connected with an Italian since I’ve lived here. Grace sitting by the fire at our hostel! Traveling this past month and a half has been some of the best times of my life. Experiencing and exploring new countries on my own or with friends made me grow and become more independent. I could never have imagined myself doing any of this a year or two ago, but now I am ready for the next adventure to begin. I welcome the challenges I will be faced with while exploring the world. This time abroad has made me realize how much I want to learn about other countries and experience different cultures. Alexa is a fall 2017 SAI Florence student from Saint Mary’s College of California.